This Demonstration presents the atomic structure of superlattices based on graphene nanoribbons. All the structures have the same wiggly shape but different connections of edges. where , and are elementary lattice vectors and , and are integers [1, 2]. The crystallographic orientation of the elementary vectors and defines the ribbon edges to be of type zigzag ( ) or armchair ( ). The apex angle is the angle between vectors and . The edge type and the apex angle are used for classifying the wiggly structures. The snapshots present the four types of zigzag-shaped graphene nanoribbons. The crystallographic orientation of the third elementary vector determines the width ratio between the two fragments of the zigzag-shaped ribbon. The widths of fragments built on the vectors , and , are meant to be measured perpendicular to the vectors and . The width ratio is set to unity in this Demonstration, though a more generic case can also be considered . The integers , and specify the length and the width of the zigzag-shaped ribbon unit cell. The whole ribbon is obtained by repeated translation of the unit cell by . In this Demonstration, only a few unit cells are shown for clarity. A similar approach to the classification and atomic position generation can be applied to other two-dimensional crystalline structures, for example, silicene quantum dots . 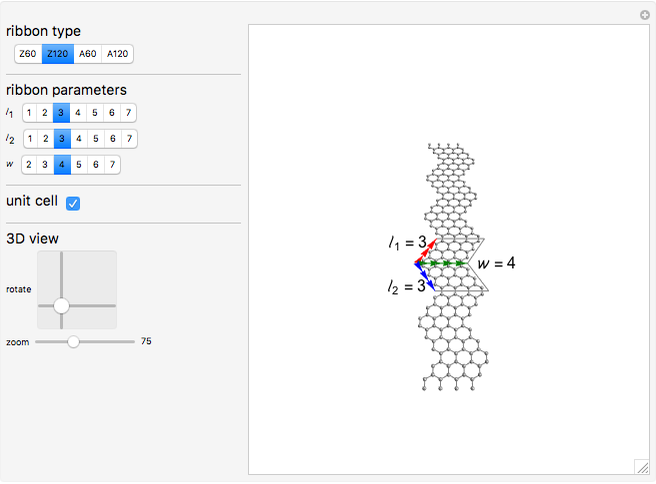 The atomic coordinates generated in this Demonstration can be used for calculating physical properties of zigzag-shaped ribbons, for example, their electronic properties [1, 2]. The optical properties of these structures can be calculated as described for zigzag ribbons with straight edges . Graphene nanoribbons very close in shape to those presented here have been produced by the self-assembling of subtly engineered organic molecular precursors . V. A. Saroka, K. G. Batrakov and L. A. Chernozatonskii, "Edge-Modified Zigzag-Shaped Graphene Nanoribbons: Structure and Electronic Properties," Physics of the Solid State, 56(10), 2014 pp. 2135–2145. doi:10.1134/S106378341410028X. 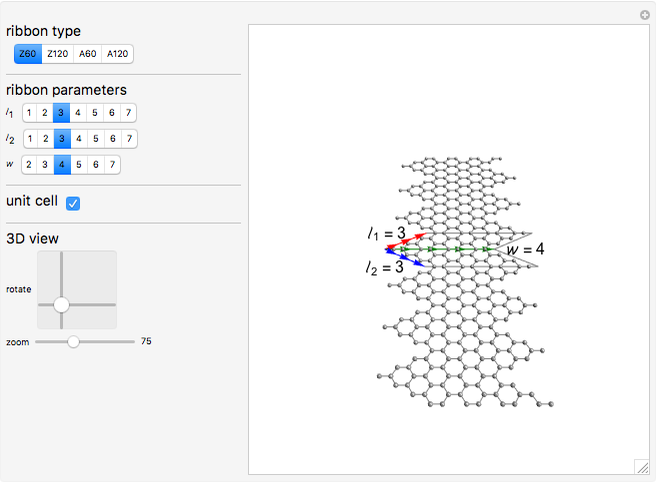 V. A. Saroka, K. G. Batrakov, V. A. Demin and L. A. Chernozatonskii, "Band Gaps in Jagged and Straight Graphene Nanoribbons Tunable by an External Electric Field," Journal of Physics: Condensed Matter, 27(14), 2015 145305. doi:10.1088/0953-8984/27/14/145305. V. A. Saroka and K. G. Batrakov, "Zigzag-Shaped Superlattices on the Basis of Graphene Nanoribbons: Structure and Electronic Properties," Russian Physics Journal, 59(5), 2016 pp. 633–639. doi:10.1007/s11182-016-0816-6. H. Abdelsalam, M. H. Talaat, I. Lukyanchuk, M. E. Portnoi and V. A. Saroka, "Electro-absorption of Silicene and Bilayer Graphene Quantum Dots," Journal of Applied Physics, 120(1), 2016 014304. doi:10.1063/1.4955222. V. A. Saroka, M. V. Shuba and M. E. Portnoi, "Optical Selection Rules of Zigzag Graphene Nanoribbons," Physical Review B, 95(15), 2017 155438. doi:10.1103/PhysRevB.95.155438. F. Schulz, P. H. Jacobse, F. F. Canova, J. van der Lit, D. Z. Gao, A. van den Hoogenband, P. Han, R. J. M. Klein Gebbink, M.-E. Moret, P. M. Joensuu, I. Swart and P. Liljeroth, "Precursor Geometry Determines the Growth Mechanism in Graphene Nanoribbons," The Journal of Physical Chemistry C, 121(5), 2017 pp. 2896–2904. doi:10.1021/acs.jpcc.6b12428. 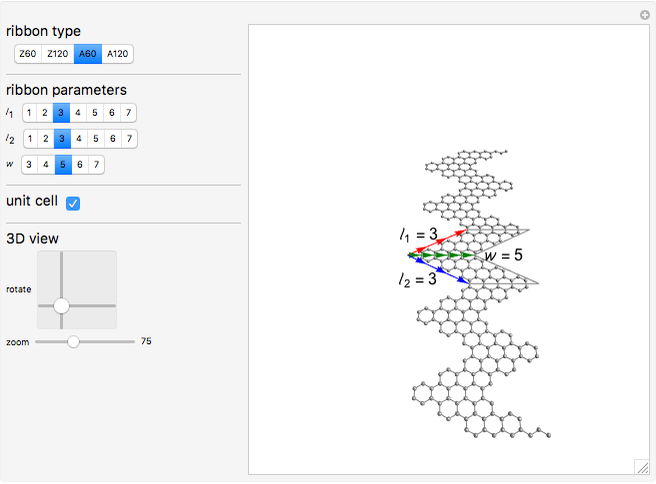 Vasil Saroka "Zigzag-Shaped Graphene Nanoribbons"